Saturated hydrocarbons can be mineralized by bacteria and yeasts and have been used as an energy and carbon source for the production of single-cell protein (SCP). n-Alkanes are very important components; and their content in distillation products increases as their boiling points decrease. The solubility in water is only about 0.002 mg L-1 for compounds with 12 or more C-atoms (Mackay and Shiu 1981). For solutions with concentrations above solubility, the oil phase can be dispersed as small droplets with adequate energy input, e.g. with a rotor-stator system. A stable oil-water emulsion can be produced with high energy input and the addition of an emulsifier. An emulsion produced from n-dodecane (750 mg L-1) with a surfactant (Eumul-gin ET5, Henkel; 150 mg L-1) and at a rotational speed of 10000 min-1 for 1 min was designated as a standard emulsion (Cuno 1996). The distribution of oil droplets of this standard emulsion is presented in Fig. 9.3. It could be demonstrated by biodegradation experiments of emulsions with mean droplet diameters between 1 and 15 pm that the bacterial growth rate was completely independent of the droplet size (Fig. 9.4). These results can only be understood if the following mechanism of the oil biodegradation is assumed: the bacteria were covered by oil layers during collisions and then oil diffused into the cells. It is probable that the microkinetics of oil biodegradation is rate-limiting. 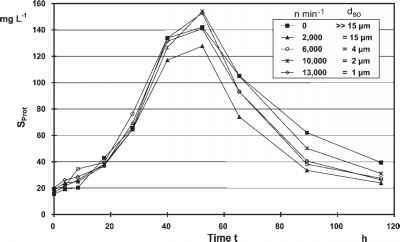 The following results of a kinetic biodegradation study were obtained with the standard emulsion mentioned above (Cuno 1996): T = 20°C, YX/S = 1.34 g MLSS (g DOC)-1, pmax = 4.08 d-1, KS = 22.9 mg DOC L-1, kd = 0.96 d-1. The result makes it probable that, in these experiments, mass transfer was not rate-limiting. Fig. 9.3 Oil droplet distribution of the standard emulsion (Cuno 1996). 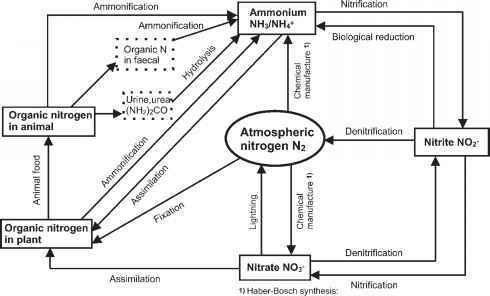 n = stirrer speed, SDo = concentration of n-dodecane, ni = number of droplets of each size range, n0 = total number of droplets, tm = mixing time, SET5 = concentration of the emulsifier, dm = mean diameter of droplets. Fig. 9.4 Concentration of protein Sprot from growing bacteria for ra-dodecane emulsions with different mean diameter of the droplets (Cuno 1996). 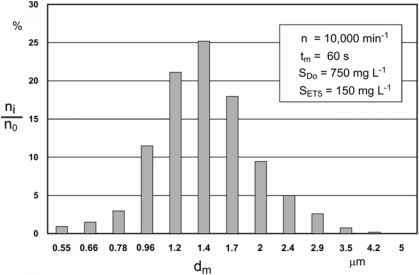 n = stirrer speed, d50 = diameter of 50% of the droplet distribution, t = time, Sprot = concentration of protein.